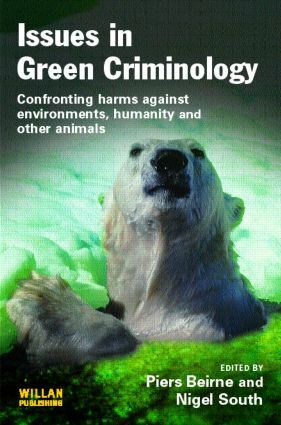 Issues in Green Criminology: confronting harms against environments, humanity and other animals aims to provide, if not a manifesto, then at least a significant resource for thinking about green criminology, a rapidly developing field. It offers a set of specially written introductions and a variety of current and new directions, wide-ranging in scope and international in terms of coverage and contributors. It provides focused discussions of current and cutting edge issues that will influence the emergence of a coherent perspective on green issues. The contributors are drawn from the leading thinkers in the field. The twelve chapters of the book explore the myriad ways in which governments, transnational corporations, military apparatuses and ordinary people going about their everyday lives routinely harm environments, other animals and humanity. The book will be essential reading not only for students taking courses in colleges and universities but also for activists in the environmental and animal rights movements. Its concern is with an ever-expanding agenda − the whys, the hows and the whens of the generation and control of the many aspects of harm to environments, ecological systems and all species of animals, including humans. These harms include, but are not limited to, exploitation, modes of discrimination and disempowerment, degradation, abuse, exclusion, pain, injury, loss and suffering. Straddling and intersecting these many forms of harm are key concepts for a green criminology such as gender inequalities, racism, dominionism and speciesism, classism, the north/south divide, the accountability of science, and the ethics of global capitalist expansion. Green criminology has the potential to provide not only a different way of examining and making sense of various forms of crime and control responses (some well known, others less so) but can also make explicable much wider connections that are not generally well understood. As all societies face up to the need to confront harms against environments, other animals and humanity, criminology will have a major role to play. This book will be an essential part of this process. Non-compliance in small-scale fisheries: a threat to security?